(May 12): Debt-laden state investor 1Malaysia Development Berhad (1MDB) has pledged to give its cooperation to Parliament's Public Accounts Committee (PAC), which has begun a probe into its operations, declaring that it had nothing to hide. 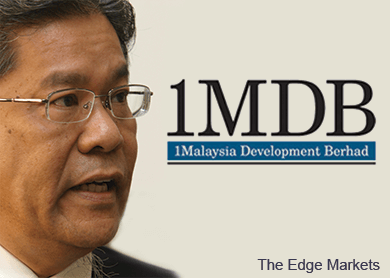 1MDB chairman Tan Sri Lodin Wok Kamaruddin said, however, he has not seen any letter from the PAC requesting that he and other senior management present themselves for an inquiry by the parliamentary bi-partisan committee. "If invited I will attend. I think they (the rest of the management) have to attend as well," he said today after attending the launch of MyTown shopping centre in Jalan Cochrane, Kuala Lumpur, a new development scheduled to open in the last quarter of 2016. Lodin Wok is also Boustead Holdings Berhad deputy chairman and group managing director. Boustead is partnering with Ikano Pte Ltd to open the 1.1 million sq ft mall which will also house Malaysia's second Ikea store. The Malaysian Insider reported yesterday that PAC would commence its investigation into 1MDB on May 19, without waiting for the outcome of the Auditor-General's probe into the fund's accounts. The PAC said it would call the Treasury secretary-general Tan Sri Mohd Irwan Serigar Abdullah to give his statement, as well as the Economic Planning Unit (EPU) director-general Datuk Seri Dr Rahmat Bivi Abdullah. "The PAC, the following week, will also call on 1MDB chief executive officer Arul Kanda Kandasamy and his predecessor Datuk Shahrul Ibrahim Halmi, who served the company from March 2009 until March 2013," PAC chairman Datuk Nur Jazlan Mohamed said in a statement yesterday. A source had told The Malaysian Insider that Lodin Wok and former chairman Tan Sri Bakke Salleh would also be summoned, as well as Lembaga Tabung Haji's group managing director Tan Sri Ismee Ismail, who has been a member of 1MDB's board since the company's inception in 2009. There are also plans to call Bank Negara and the company's auditors KPMG, Ernst & Young and Deloitte. Lodin Wok said today he has yet to receive the PAC letter, adding that he has not checked with 1MDB's management. He said he had nothing to hide, "as far as I am concerned". But he also re-directed questions from the media today on the company's dealings to 1MDB chief executive, Arul Kanda. "I think you have to address that to the management, to Arul," he said. He was asked about new claims today by PKR that 1MDB had four months left before a deadline to service RM3.6 billion in loans from six international banks. PKR's Pandan MP Rafizi Ramli had earlier today questioned whether 1MDB had sufficient funds, citing information he received that the collateral for the RM3.6 billion loan was money in 1MDB's account in BSI Bank Singapore. But it has been revealed that this account merely contained "paper assets, the "true value of which cannot be determined", according to whistleblower website Sarawak Report which made the exposé on April 22. Rafizi said that if this was true, 1MDB might have to resort to using public funds to meet the September payment deadline, since its account in BSI Bank reportedly had no actual cash. 1MDB borrowed the RM3.6 billion from a consortium of six international banks led by Deutsche Bank in October last year, and Rafizi added that sources told him the interest rate was at 11% – which meant 1MDB had to pay around RM4 billion, to the banks within four months. Criticism has been mounting against the wholly-owned Finance Ministry investment vehicle, which has chalked up debts of up to RM42 billion, since it was established in 2009.